If you own a mobile phone, chances are you noticed the test of the system that occurred just after 2 p.m. ET today. Most are likely familiar with the system’s use by local authorities to send alerts for severe weather and missing children. But today marked the first time the system had been tested by the Federal government on a national level. “That in itself is a testament to how digital and mobile is a connectivity point between citizens and government,” Kent said this morning at a Dell Technologies Summit. Kent cited the test as an example of the administration’s responsibility to create digital technologies that augment citizens’ everyday lives. “On the digital side, the focus is delivering high quality services to American citizens, and we are tasked every day to be effective stewards of taxpayer money,” she said. She also cited the President’s Management Agenda, and its fourth cross-agency priority (CAP) goal, “Improving Customer Experience,” as evidence of how the executive branch is placing “aggressive focus” on better digital experiences for citizens. Kent’s comments regarding that focus also seem to be reflected in actions on the part of the legislative branch. A proposed bill, the 21st Century Integrated Digital Experience Act, would push Federal agencies toward better citizen services–creating minimum standards for website functionality and “digital options” for any in-person government service. Last week the bill was approved by the Senate Homeland Security and Governmental Affairs Committee, after a companion bill had been introduced in the House earlier in the year. Kent also lauded the Department of Veterans Affairs, the recipient of an award yesterday from the Partnership for Public Service for their work to improve veterans’ access to online resources. Kent mentioned these accomplishments in the context of broader modernization efforts spearheaded by the administration, such as the release of a new White House cyber strategy on Sept. 20 and the new Federal Cloud Smart strategy on Sept. 24. “That’s just the last two weeks. That’s not stopping. We have more coming in the near future,” Kent said, making good on comments she made at the end of August that the administration would be rolling out various updates to Federal IT policies. 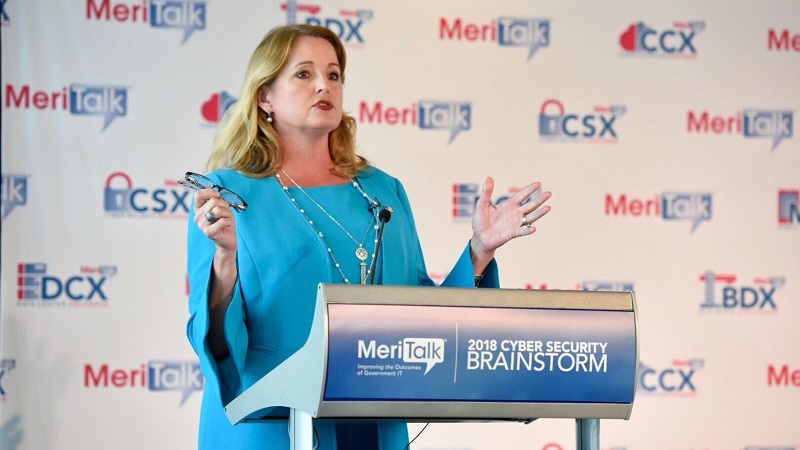 Among those near-future updates, Kent again highlighted the forthcoming changes to Federal Information Security Modernization Act reporting, and hinted at progress on reforming the Trusted Internet Connections initiative. She closed her speech with a call to action for the assembled crowd of IT professionals, framed by the soon-to-arrive emergency alert. “So when your phone beeps today and you get the text message from the president, pause and think about what that means about how important digital channels are in the lives of every American, and think about what your role is in continuing to deliver services much more quickly and more impactfully,” Kent said.